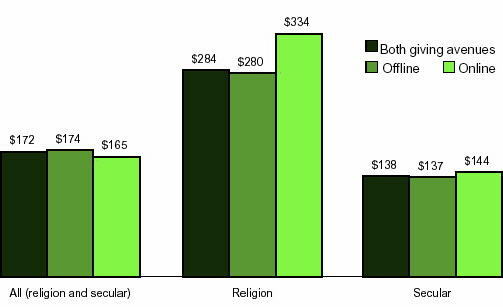 The study reports that the average gift size is $172, but most gifts are less than $100, suggesting that most nonprofits rely on large numbers of small donors rather than on the headline-making major bequests. Six percent of donors give online, and there is little difference between online and offline giving in the size of donations. Gifts did vary by type — secular or religious — and by season. Holidays, as nonprofit fundraisers have long been aware, do seem to spark a spirit of giving. Almost one-quarter of annual donations are reportedly made in the last six weeks of each year. And it’s interesting to note that 20% of online donors said that they give more during the holiday season than during the rest of the year, compared with 13% of offline donors. When asked why they did not give online, the single largest reason — after not having a computer — that people offered is that they were unaware of online contribution options. More than one quarter (28 percent) of offline-only donors said that they did not give online because they could not find an online giving site, they did not know they could make a gift online, or they did not think of giving online. Donors over 55 years of age are most likely not to have Internet access, the report says, while younger donors lack the knowledge that Internet donation is an option. Among those who contributed online, one in five (20 percent) said the primary motivation for giving online related to whether the charity actively promoted online giving choices — either they received an appeal from the charity with a link or easily found an online giving option. This survey reached over 1,300 households in the United States in September 2007. The full report, prepared by the Center on Philanthropy, may be obtained from the American Express website, free, in PDF format. Thanks for this post and the link. This is great info to have as we head into the annual campaign season!